A Democratic rally and pasta dinner will be held on Sunday, October 31st on the eve of the Nov. 2 Election. The rally and dinner — a tradition in New Britain — will be held from 1 to 4 p.m. at the Veterans of Foreign Wars Hall, 41 Veterans Drive. Sponsored by the city’s legislative delegation campaign committees, including State Senator Don DeFronzo State Representatives John Geragosian, Peter Tercyak, Betty Boukus and Tim O’Brien. The rally is expected to draw statewide candidates and party leaders with music, games for children and the pasta dinner. Admission is free. 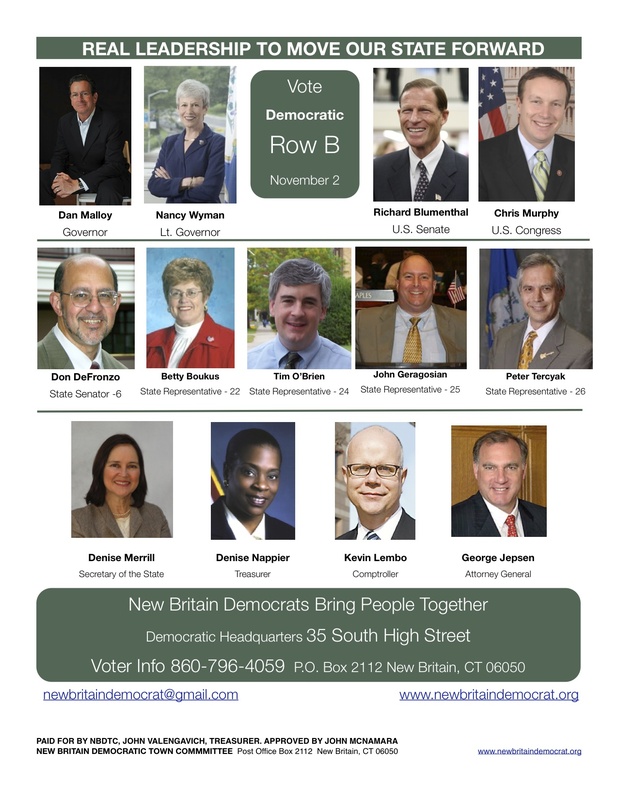 Tickets are available upon request to newbritaindemocrat@gmail.com or by calling Democratic headquarters at 860- 796-4059. Disclaimer: Approved by Don DeFronzo. Paid for by DeFronzo for State Senate, Suzanne Bielinski, Treasurer. Approved by John Geragosian. Paid for by Geragosian 2010, Shirley Black, Treasurer. Approved by Peter Tercyak. Paid for by Tercyak 2010, Bryan Sabin, Treasurer. Approved by Betty Boukus. Paid for by Friends of Betty Boukus, Gary M. Boukus, Treasurer. Approved by Tim O’Brien. Paid for by O’Brien for State Representative, Emilia Vasquez-Skene, Treasurer. This entry was posted in Endorsements, Meeting/Event, Rock The Vote. Bookmark the permalink.